The brand new Digg is under fire on its first ever Monday from both its most loyal users and the competition at Reddit. In response to Digg v4's debut just last Wednesday, power users launched a Digg Revolt today, some calling it "Quit Digg Day," and the Reddit community has embraced the feud. 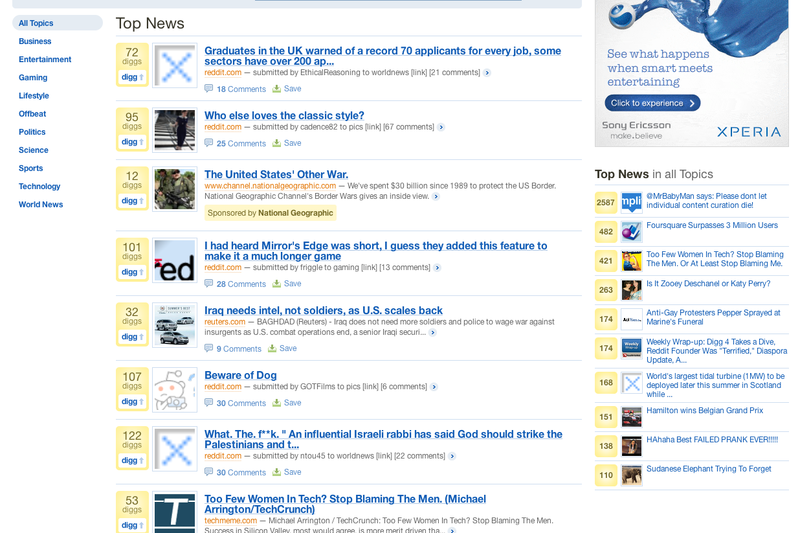 Reddit links have been dominating the Digg.com Top News feed throughout this morning. At one time, six of the top seven stories were from Reddit. On top of that, Digg's traffic has plummeted 33 percent overnight, according to Alexa.com. Said one Digg power user, @0boy, "Since @Digg and @kevinrose haven't listened to their core users, I hate to say it but they deserve this mess." Reddit is taking advantage of the controversy. It posted a "self-announcement" on its homepage for those "new around here" and even altered its logo to include a shovel (see below), an apparent shot at Digg. This hardworking detailed Digg community feels as though they have been short-handed with the new launch of Digg v4 since its decision to allow auto-feeds, the demise of power Digger's and the obliteration of their history on Digg, almost nullifying their existence. Some Digg power users have taken to Twitter to share their disgust with the new site, and the #diggrevolt hashtag is going strong. In addition to the above, @0boy also tweeted, "The saddest part: hundreds of avid @digg users saw this coming, clear as day. @mrbabyman @msaleem @thenextweb @ltgenpanda 100+ more." Digg CEO Kevin Rose was silent for much of this morning, as Reddit began flooding Digg, but finally tweeted this afternoon, "Digg update: As mentioned on TWiT yesterday, we're working hard to fix the source diversity part of the digg algorithm, more news soon." UPDATE: Rose is also replying to some on Twitter. He said to @kiantech, "this too shall pass, it's revolt #5 for us, we have to fix some features, but we'll get back to normal soon," and to @SirBV, "i never had control, this is revolt #5, the trick is building the right tools for the audience, we have work to do." "This thing keeps getting reported as either Reddit attacking Digg or the power users trying to take it down but it's EVERYONE. I've been a Digg user since the beginning. I'm not a power user and I've never once logged on to Reddit. This new Digg destroys the balance of power and Kevin Rose is either too stupid to see it or just stands to make so much cash off this new scheme he doesn't care. Sure, they hurt the power users but they also took away all the power a regular Digg user had. They took the "Upcoming Stories" away which allowed us to have input on what made the front page. They also took away the "Bury" button which gave us the power to remove double-posts, spam, and stuff that was just downright stupid. They forced us into a new opening page without any ability to get rid of it. They broke EVERYTHING (technically the damn thing just doesn't work)."